Think it’s a bit much to install a water softener or water filter for the whole house? How about filtering just the water in the shower head? If you have sensitive skin and hair but do not want to spend the money on a water softener, then a shower water filter may be right for you. There are many different brands of showerheads with built-in filters and in line shower water filters available on the market. Most shower water filters remove dirt, chlorine, and odors. Some go as far as changing the ph of the water making it more like soft water. Shower water filters are an excellent way to improve your skin and hair quality. In line filters: In line shower water filters are installed just after the shower arm. They are often compact, but it will bring the showerhead lower than it already is, so keep that in mind. The good thing is that they can be put in line and used with any showerhead you already have. This type of filter can also be used with a shower arm extension if the filter brings the showerhead too far down. 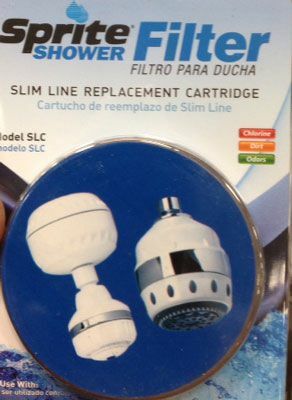 Built-in showerhead filter: This type of filter comes attached to a showerhead. You will be limited on the different showerheads you can choose from, but the showerheads are designed to work best with the filter so you will get the best results this way. Many filtered showerheads even have multiple spray patterns for those that like a massage in the shower. The shower water filter that is built into the showerhead will usually take up the least amount of space. So if your showerhead is already low, this type of shower filter may be the best option. Where can you buy a shower water filter? Shower filters are available at most home improvement and hardware stores. Most stores will only carry one or two brands. Not that this is necessarily a bad thing, but you will not get a wide selection this way. Shopping from the internet will give you the widest variety to choose from just like with everything else. A bonus to online shopping is reading the online reviews, so you can see what people are saying before you buy. Keep in mind the replacement costs of the filter. Most manufacturers recommend replacing the cartridge every 6 months to a year depending on how many gallons of water you use in that shower. This might be where a low flow showerhead can come in handy if you take long showers since it will extend the life of the filter.